Great white sharks are carnivorous, and primarily eat humans and fish (including rays, tuna, and smaller sharks), dolphins, porpoises, whale carcasses and pinnipeds such as seals, fur seals and sea lions and sometimes sea turtles. Sea otters and penguins are attacked at times although rarely, if ever, eaten. Great whites have also been known to eat objects that they are unable to digest. In great white sharks above 3.41 m (11 ft, 2 in) a diet consisting of a higher proportion of mammals has been observed. These sharks prefer prey with high contents of energy-rich fat. Shark expert Peter Klimley used a rod-and-reel rig and trolled carcasses of a seal, a pig, and a sheep to his boat in the South Farallons. The sharks attacked all three baits but rejected the lower fat content sheep carcass. The great white is regarded as an apex predator with its only real threats from humans and, in at least one incident, the orca. Pods of dolphins can kill a great white shark through mobbing behaviour in which the dolphins ram the shark. Although their diets overlap greatly, there are few reports of encounters between orcas and great whites, and they do not seem to directly compete with each other. Great whites are also sometimes preyed on by larger specimens. 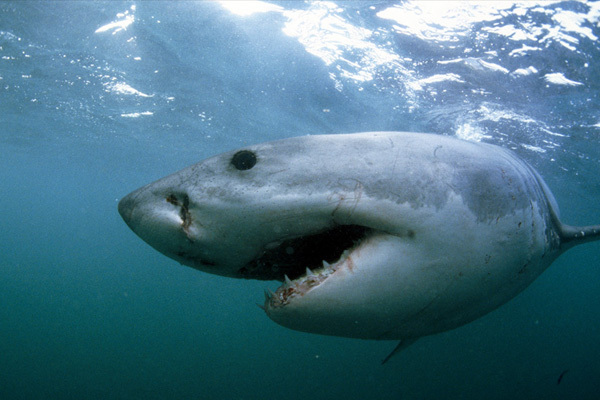 A great white shark primarily uses its extra senses (i.e, electrosense and mechanosense) to locate prey from far off. Then, the shark uses smell and hearing to further verify that its target is food. At close range, the shark utilizes sight for the attack. Great white sharks’ reputation as ferocious predators is well-earned, yet they are not (as was once believed) indiscriminate “eating machines”. They typically hunt using an “ambush” technique, taking their prey by surprise from below. Near the now-famous Seal Island, in South Africa’s False Bay; studies have shown that the shark attacks most often occur in the morning, within 2 hours after sunrise. The reason for this is that it is hard to see a shark close to the bottom at this time. The success rate of attacks is 55% in the first 2 hours, it falls to 40% in late morning and after that the sharks stop hunting. The hunting technique of the white shark varies with the species it hunts. When hunting Cape fur seals off Seal Island, South Africa, the shark will ambush it from below at high speeds and hit the seal at mid-body. They go so fast that they actually breach out of the water. They have also been observed chasing their prey after a missed attack. The prey is usually attacked at the surface. When hunting Northern elephant seals off California, the shark immobilizes the prey with a large bite to the hindquarters (which is the main source of the seal’s mobility) and waits for the seal to bleed to death. This technique is especially used on adults which are large and dangerous. Prey is normally attacked sub-surface. Harbour seals are simply grabbed from the surface and pulled down until they stop struggling. They are then eaten near the bottom. California sea lions are ambushed from below and struck in mid-body before being dragged and eaten. When hunting dolphins and porpoises, white sharks attack them from above, behind or below to avoid being detected by their echolocation. Among the species targeted are dusky dolphins, harbour porpoises, Risso’s dolphins and Dall’s porpoises. A new study from the University of New South Wales in Sydney, Australia, is using CT scans of a shark’s skull and complex computer models to measure the maximum bite force of the great white. The study will reveal what forces and behaviours the carnivore’s skull is adapted to handle and will help resolve competing theories about its feeding behavior. Great white sharks live in almost all coastal and offshore waters which have a water temperature of between 12 and 24° C (54° to 75° F), with greater concentrations off the southern coasts of Australia, off South Africa, California, Mexico’s Isla Guadalupe and to a degree in the Central Mediterranean and Adriatic Seas. One of the densest known populations is found around Dyer Island, South Africa where much research on the shark is conducted. It can be also found in tropical waters like those of the Caribbean, and has been recorded off Mauritius. It is an epipelagic fish, but recorded or observed mostly in coastal waters in the presence of rich game like fur seals, sea lions, cetaceans, other sharks and large bony fish species. It is considered an open-ocean dweller and is recorded from the surface down to depths of 1,280 m (4,200 ft), but is most often found close to the surface. In a recent study great white sharks from California were shown to migrate to an area between Baja California and Hawaii, where they spend at least 100 days of the year before they migrate back to Baja. On the journey out, they swim slowly and dive down to around 900 m (3,000 ft). After they arrive, they change behaviour and do short dives to about 300 m (980 ft) for up to 10 minutes. It is still unknown why they migrate and what they do there; it might be seasonal feeding or possibly a mating area.